Her skin was toasted like a crispy brown marshmallow roasted over a summer campfire. The tanned hue was so perfect, it could be a Starbucks flavor. Mocha Marshmallow. Her skinny hip bones drew attention to her flat abdomen where a clingy bikini showed off her curves. You could balance your drink on her waist, it was so flat. I cocked my head and bit my lip. It was only an image on my computer screen but the girl was so perfect it wasn't even fair. And I am a naturally thin person! But this girl brought beautiful to a whole new level. It was obvious now. This was the new standard. This is the “beach body” that girls are chasing after. This is how we want to look. We desire to look like all the pretty girls we see on magazine covers, T.V. Screens and Tumblr blogs. We're chasing down that perfect beach body. It's an image that most of us find unattainable. We're forever being bombarded with greasy foods, fatty snacks, and candy-tasting sugar drinks that keep us overweight. How can a girl possibly rid herself of these delicacies to get a body like that in time for summer? It's a tough choice...a bag of Cheetos’s, or a dream body? Both of these options leave us miserable and unsatisfied. The girl who starves herself hates her body. And the girl who indulges in every cupcake that passes by loves her body's cravings just a little bit too much. So where's the balance? Is it possible to eat well, be at a healthy weight, and feel good about yourself without bouncing from one extreme to the other? Absolutely YES! These three steps will get you off your sugar craze, avoiding the “skinny” deception, and help you step into the healthy, beautiful life that you always knew you could have! Before we go any further talking about food and body image, I want you to get this deep in your heart: What the scale says is just a number. It does not define who you are. God gave you a beautiful body. He blessed His daughters with a beautiful array of different body types. We were not created to all look the same! God purposefully made girls with large frames, small frames, big hips, little hips, tall, short, thick legs, boney arms, ect. If he wanted everyone to be a carbon copy of a magazine model He would have done that! You are not a mistake. Every detail of your body was carefully thought out. If you're not happy with your life now, you're not going to be any happier in a size two. I am a naturally small person. I'm thin, wiery, and kinda boney. So many girls would envy my body because I have what this generation thinks is, “IT” right now. Why am I telling you all this? I don't want you to fall for the “skinny” trap. The world tells us that if we get skinny we will be happier. I'm thin, and sometimes I wish I wasn't so tiny! Couldn't I have bigger hips, or a bigger bust, maybe a little more normal looking body? Thinking like this is wrong. Happiness does not depend on your weight, life situations, what you had for breakfast, or which guy on the basketball team things you're a hottie. Genuine happiness can only come from one place. Peace with your Creator. He created you for a purpose and calls you beautiful just the way you are. If you align with Him and ask God to fill your life with peace and joy, then and only then will you find that satisfaction you've been longing for. You can't find it on the treadmill. I didn't find peace and confidence by standing on the scale. I found it in my Heavenly Father's arms. God's Word makes it pretty obvious...He made no mistake with your body. Big, small, or somewhere in-between you are made exactly the way He wanted you to be. But God also makes something else clear. We are supposed to take care of our bodies and keep them healthy. This is where so many girls get confused. The words “diet” and “healthy” get swaped around with one another, even though they DON'T mean the same thing. When I talk about healthy eating, I am NOT talking about dieting. Diets are ridiculous and can also be dangerous. Obsessing over your weight and fretting about food can lead to very damaging behaviors and mindsets. Living and eating healthy is a different story! What's the big difference between dieting and eating healthy? A DIET- Is a dangerous activity where a girl gets hyper focused on what she cannot eat. This is a form of hurting herself, giving herself ridiculous boundaries, trapping herself in a cage. A girl who is dieting counts carbs, calories or grams. Diets are all about what you CANNOT have, and making yourself miserable to loose some pounds. A diet strives to satisfy the scale, who like a thirsty leach is NEVER satisfied. Dieting makes you a victim of self-hatred. 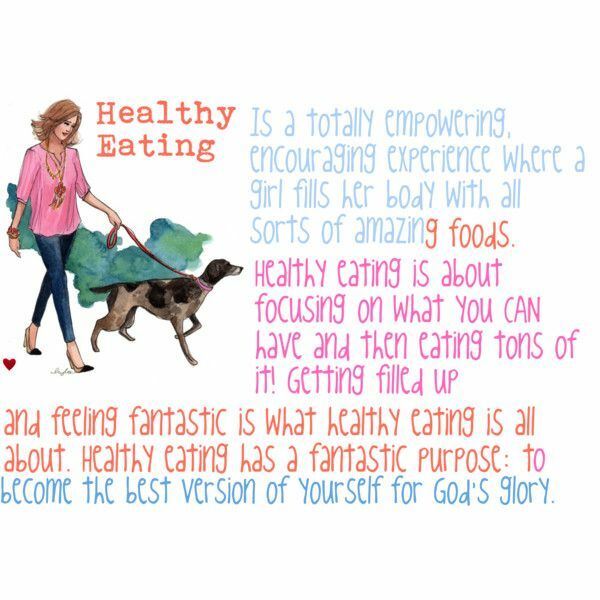 HEALTHY EATING- Is a totally empowering, encouraging experience where a girl fills her body with all sorts of amazing stuff. Healthy eating is about focusing on what you CAN have and then eating tons of it! Getting filled up and feeling fantastic is what healthy eating is all about. Healthy eating has a fantastic purpose: to become the best version of yourself for God's glory. But wait...does God really want us to be healthy? God has so many amazing plans for you, things He desires that you accomplish great things as you co-work with Him to bring His love into the World! He has exhilarating missions, mountains to climb and hurdles to jump! If you want to be your best for Christ, you have to be operating your highest potential...(making the most of every opportunity.) If you're going to be like Christ, do the impossible, and reach your dreams, you've got to be mentally and physically prepared. What do I mean by mentally and physically prepared? I simply mean, if you want the absolute BEST coming out, you have to put the BEST in. Ever heard the phrase, “You are what you eat”? Well, that is frighteningly true. Our bodies were made to absorb and use every food and ingredient that we consume, to build our bodies with. Just like our hearts and minds are always work in progress, so are our bodies. They are growing and changing everyday. They adapt to the foods we eat and the atmosphere we live in. 3) Wanna Know A Secret? Skinny Girls Eat...A LOT! I don't know where we got the idea that less food equals skinny. We've been told to avoid all fat. To skip meals. To not eat meat. But where has that gotten us? Nowhere but miserable. A healthy girl isn't focused on eating less of something. She's focused on all the wonderful things God created for her to eat...then she eats as much as she wants! What do I mean by living foods and dead foods? Living foods are God-given foods are in their natural state. Meaning, no one has altered these foods with chemicals. Living foods are raw or nearly raw. Foods that fall under this category include fresh or frozen fruits and vegetables, whole grains, nuts and seeds. They have not been stripped of their fiber or other nutritious parts. Also, nothing has been added to them. They are still “alive”, with all the nutritious vitamins, minerals, fiber and enzymes intact. When we eat them this way, they bring life, energy and fullness into our bodies. How cool is that? If we eat the foods God originally gave us to mow on (which includes meat! Hallelujah!) then our bodies will be in optimal condition, ready for any life mission God might send us on! We can be ready in season and out of season, we don't have to constantly get sick with every flu bug that flies around. We don't have to feel tired, sluggish and have negative thoughts bogging us down. We can put LIFE into our bodies, and reap the benefits of it! Is there anything real about donuts, boxed sugar cereals, or a bag of cheesy chips? I know what you're thinking. You're drooling. You're panicking. You LOVE this powdery sugar stuff. God couldn't possibly ask you to give it up...would he? If your flesh is freaking out at the thought of fasting from French fries, take a deep breath. We believe these things to be normal and good for us, and don't think for second about the fact that maybe...just maybe...the food we are consuming has something to do with all this illness. Some might argue that cancer and sickness has been around forever and there's nothing to worry about. Okay, these illnesses have always been around, but right now our country has an overwhelming epidemic of sick people. Our generation is being poisoned in so many ways. One of those ways is from the foods we eat. If you're growing offensive, don't shut me off yet. Ask God to open your heart and mind to what's happening. Ask to see what's really in the food we're eating. Ask if He cares about it. Ask if He is calling His people to a higher level of purity, mentally, physically, and emotionally. Just ask. Give Holy Spirit a chance to speak to your heart. You may be surprised at what you hear. But then again, you might NOT be surprised. You might already know this to be true in your heart. Why do we all feel guilty after eating a massive piece of chocolate cake? Because we hate ourselves and don' think we should have anything good in our lives? No way! It's because we, somewhere, deep down inside, know that cake isn't any good for us. Our bodies are amazing creations. They were made to heal and transform themselves from within. Because most of us have been eating dangerous foods since we were born, our bodies need to be refreshed and renewed. We need to be strengthened! We have tremendous power to combat dangerous intruders or diseases, and we are able to cleanse themselves if we only give our bodies the chance. Of course, the choice is all ours. Just as no one can force you to wear a certain outfit pair of shoes, or demand you dress a certain way, the choice to live healthy is inertly your own. Your journey to a healthy lifestyle can start today. You don't need to go on a fad diet, swear off sweets, or shun do-nuts for the rest of your life. You don't need to be a radical health food freak! The concept is simple. Eat TONS of living foods and less dead foods. A good rule of thumb is to fill your plate with 70 percent fruits, veggies, nuts, or meat. Think more about what you CAN eat, and less what you can't eat. You're free to eat whatever you like...a healthy girl doesn't think about denying herself the pleasure of something...she just TRADES it for something else, something better. (Just like in Christ, whenever we trade something with Him, we get the better deal! It might be painful or not make sense at first, because our flesh really wants what we think we want. But God knows what we need, and will enjoy the most!) It you don't have healthy food in your home, or can't afford it, don't worry about it. Eat whatever you have, but whenever you have the opportunity to CHOOSE a fruit, veggie, meat or nuts, then go for it! A healthy girl eats for life. She eats because she wants her body to serve God. She eats because she knows God's food gives her energy. She eats because she's celebrating every moment of this crazy beautiful experience with God's energy called LIFE. A healthy girl never, ever, ever starves herself. Again, if you are in a position that you honestly have no power over what kind of food is coming into your house, eat what you have. Ask God to give you grace until you have access to healthier foods...He will! Remember, working toward a healthy lifestyle is exactly that...working. It takes baby steps. Nobody becomes radically healthy overnight. For a healthy girl, it's simple...eat MORE living foods and less dead foods! Lie DE-BUNKED: Fat does not make you fat! Her phrase frightened me. She was totally deceived. She thought that every carbohydrate would make her gain weight. So many people are confused about what actually causes weight gain. If you eat something God made, like meat, vegetables, or fruits, you are NOT going to gain unhealthy weight from it. Yes, it will build muscle, but good fats are actually good for us. We need them!